Caramelised Red Onion Chutney with Feta and Chickpeas Salad. 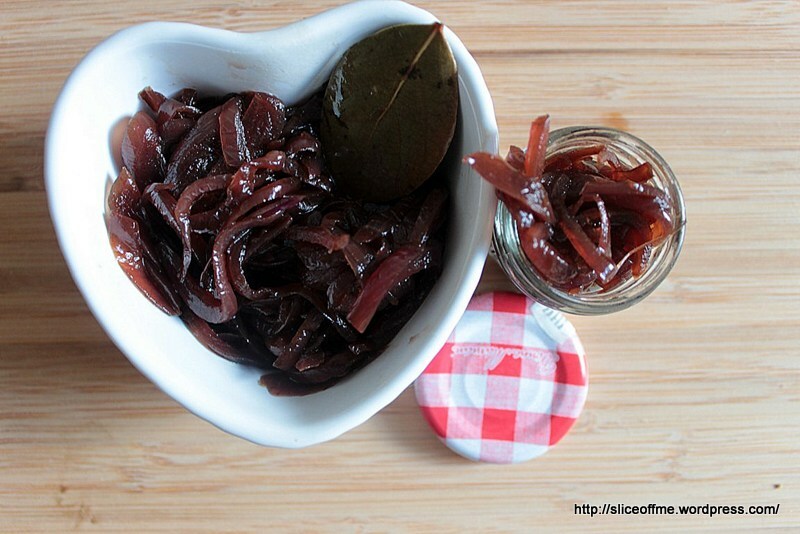 On a trip to one of my favourite supermarkets I purchased my first jar of caramelised red onion chutney. 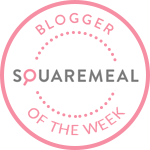 Coming from India my palate is well -acclimatised to red onions and their sharp sweet taste. The tangy taste and deep rich colour and the versatility of this chutney got me hooked onto this dish and I was using it ever so often. Since then I had been planning to make this chutney at home and after scouring for recipes online, I found this interesting recipe by Fraser Doherty – The Super Jam Cookbook. It’s a basic and simple recipe yet perfect in proportion and that’s exactly what a great recipe should be. It’s a perfect accompaniment for a good roast or in toasted sandwiches with a light soup during a cold wintry day. This chutney goes well with feta cheese and chickpea salad as it does with cheese and crackers .This is also my way of using all those empty glass jars that have been stacked behind various shelves in my tiny kitchen. Chop the red onions in fine long slices. Slice the chilli in long thin slits. 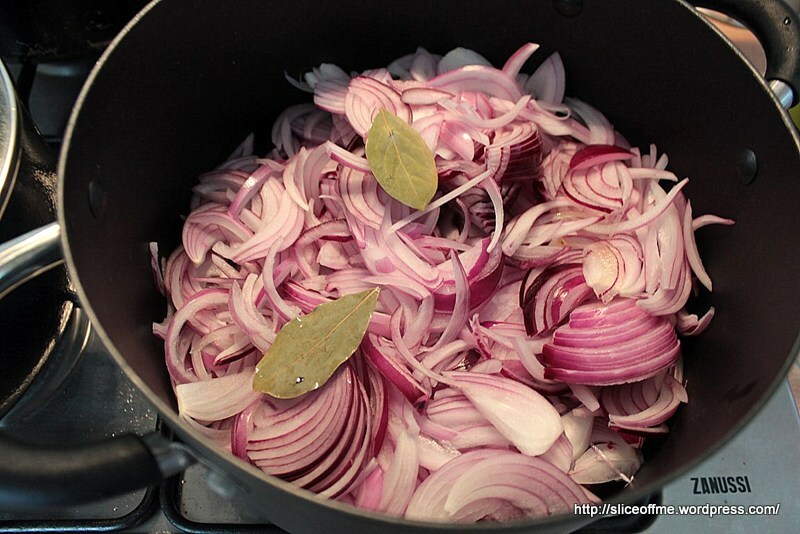 Heat the olive oil in the saucepan and add the bay leaf and chilli followed by the red onions. On a low flame stir continuously and cook for about 20 minutes. 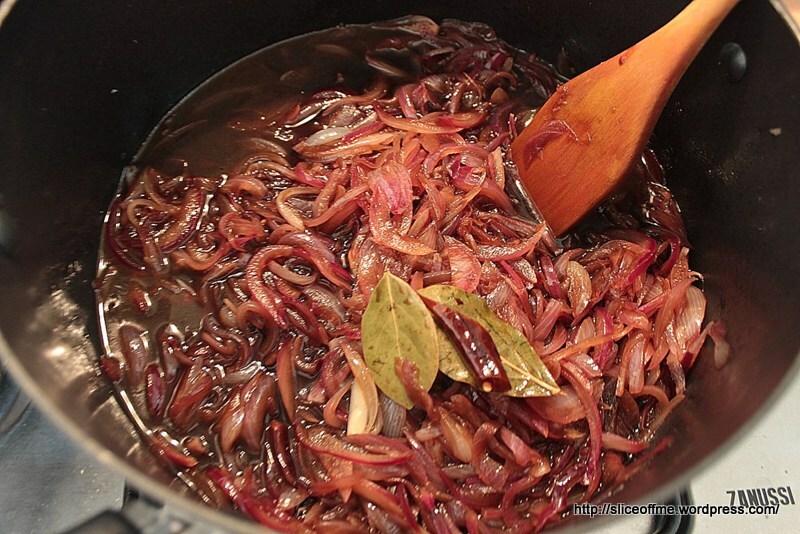 The onions will change colour now and turn dark and the mixture will have reduced in volume. 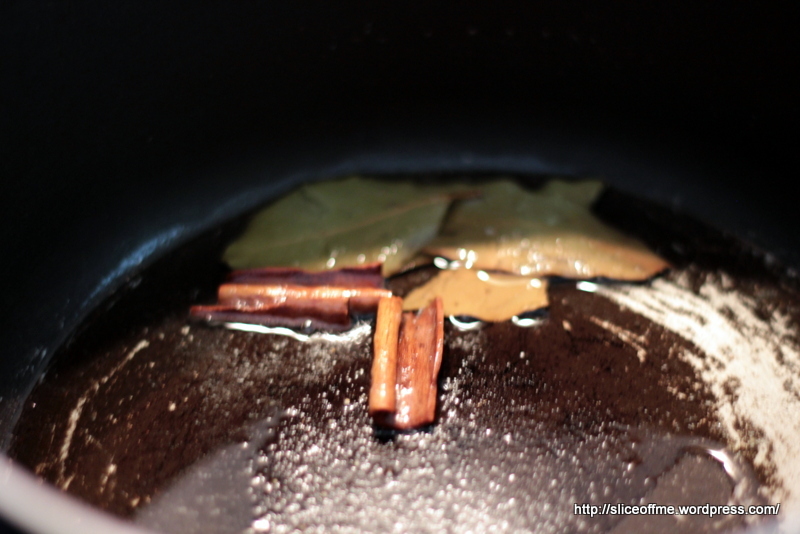 Now stir in the sugar first followed by the vinegars, I used dark muscovado sugar as I love the rich dark smoky flavour. Simmer this mixture for 30 minutes and the chutney now turns sticky and thick. While this is simmering, sterilise all those glass bottles and store the chutney in them. It takes a month for the flavour to mature fully. Create a bed of leaves and throw in the chickpeas and other ingredients. 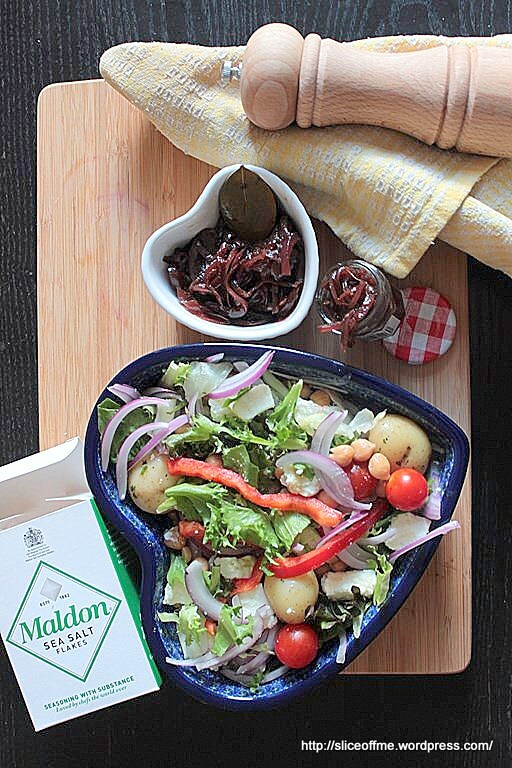 A generous dollop of the caramelised red onion chutney in this salad will offset the feta cheese beautifully. It’s great for a meatless Monday lunch or a perfect accompaniment for a big family Sunday lunch. The best part of making this chutney is that I get to give some to my friends, sharing is fun isn’t it? 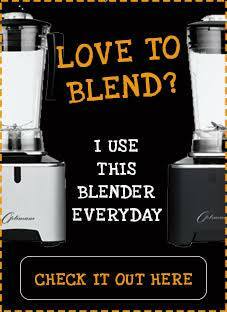 Share the post via the Great British Chefs site and leave your comments there. 2 large spoon full of any packet biryani masala. Next go in the fresh green curry leaves and green chillies, chopped onion, I used the food processor this time so it was almost a puree and this onion takes up the flavours of the spices faster I imagine. Turn off the heat for a bit,sprinkle turmeric powder,red chilli powder,cumin powder and salt to taste. Turn on the heat on a low flame and sprinkle some water enough to wet the veggies and allow for some steam to happen to cook the cauliflower. Stirring occasionally cook with a lid for about 10 minutes. garnish with freshly coriander finely chopped and a tiny squeeze of lime to add an extra twang. Eat with hot puffy rotis off the hob! 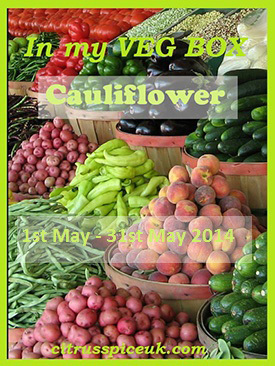 I am linking this favourite Maharashtrian vegetarian recipe for Cauliflower and Green Peas sabji with In My Veg Box for May2014 hosted by me for Nayna who Blogs at Simply.Food and Citrus Spice. 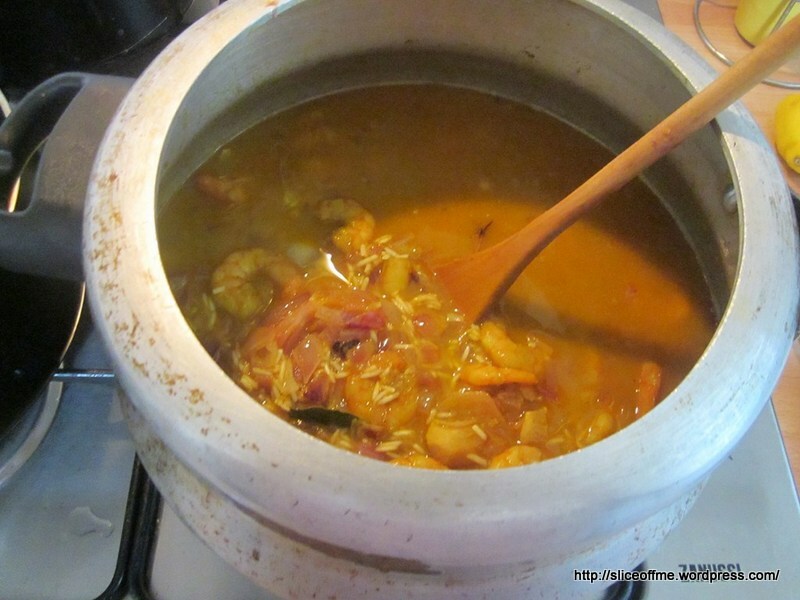 This is NOT just a recipe, it’s a Family Heirloom passed down from generations and cooked with great relish by my mother-in-law and her mum who is now 82 years old and still can stir up a some to-die-for finger licking dishes! 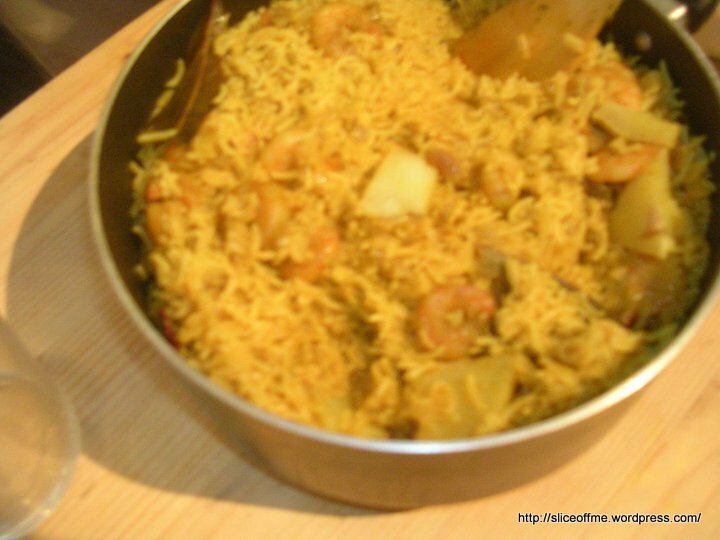 But before I start off rattling the ingredient list, a ”slice” of some history about the origin of this rice and prawn union.Coastal cuisine in the western Indian state of Maharashtra relished by the Maharahstrian community relies heavily on the use of all versions of the coconut, the most potent form being as part of the goda masala. This and ofcourse, the abundant availability fresh sea-food has given birth to many delicacies many of which most are age-old like this dish. Ok here goes, the ingredient list – This dish serves 2 adults for 2 meals with 2 generous helpings each and leftovers for the next day. Wet coconut grated and make a fine puree with it – the wet coconut is available as a frozen product at any Indian Grocery store – use about a handful. Green Masala – Use a bunch or coriander and 2 green chillies and give them a spin in the mixer, store this fine paste in the freezer and use as and when needed, it’s one of the most basic marination masala’s in most Maharashtrian non-veg dishes especially seafood. 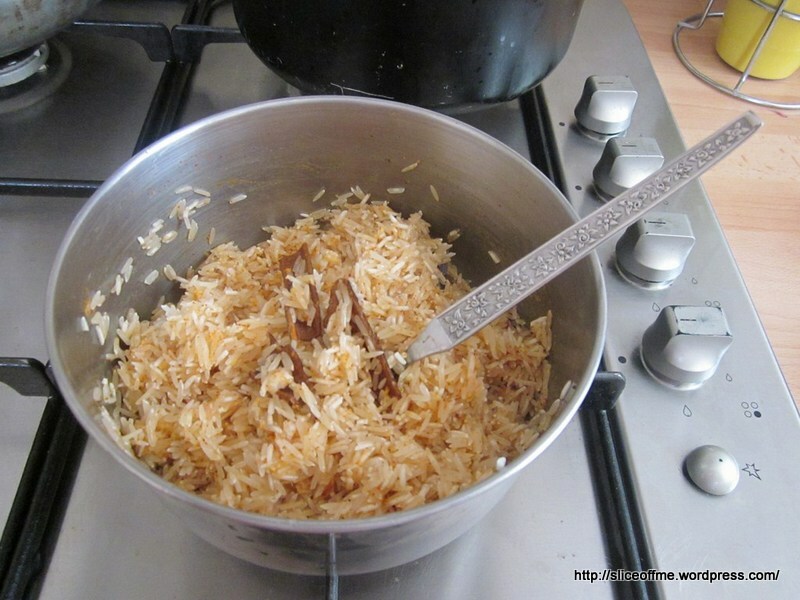 On a pan on low heat saute one finely chopped onion and the fresh wet grated coconut till the onions starts to caramelise, after this cools give it a spin in the mixer and make a fine paste. Marinate the washed rice in some the above wet grated coconut and onion paste, some ‘goda masala’ , a squeeze of half of a lime, salt, ginger and garlic paste and some Cinnamon. Keep Aside. 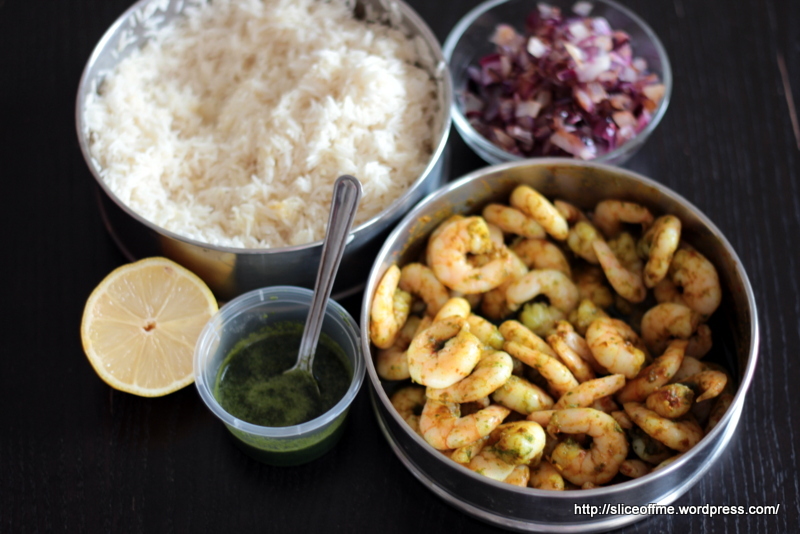 De-vein the prawns, wash under tap water and marinate with red chilli powder, turmeric and green masala. 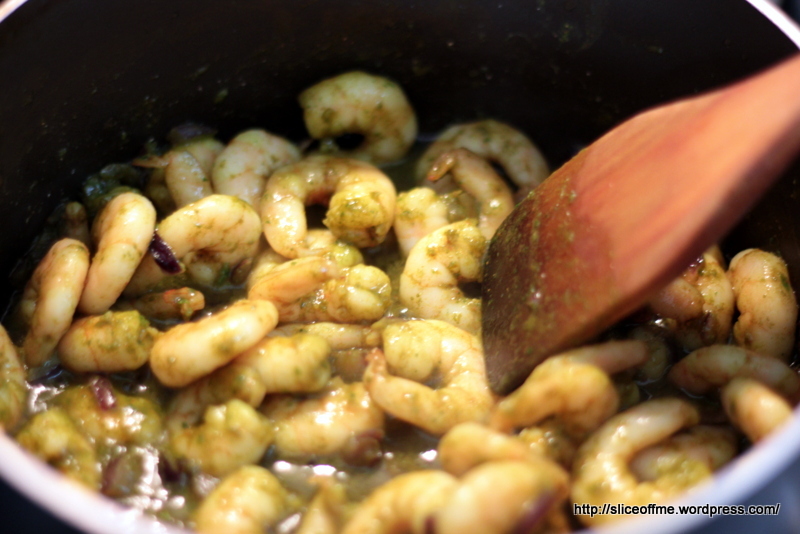 Take oil in a vessel and saute the marinated prawns for 1-2 minutes. 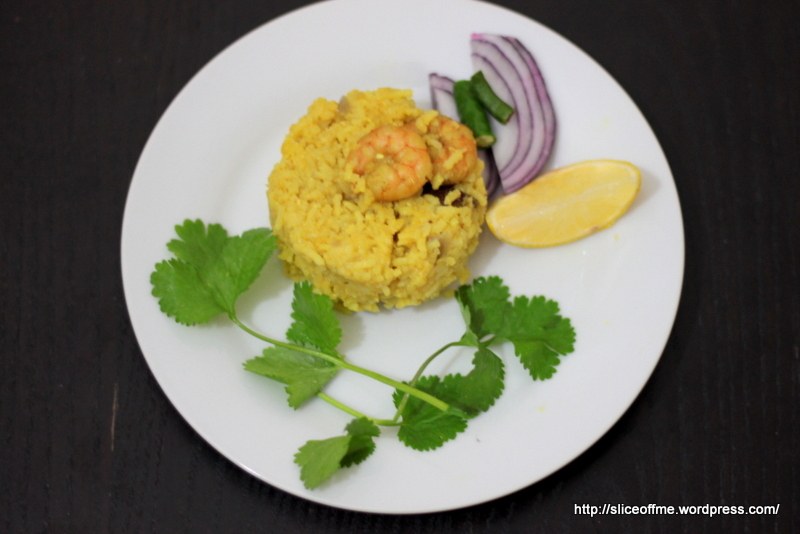 Heat Oil in a vessel big enough to cook the rice and prawns http://xanaxonlinebuy.com together that will hold the water as well , add the cloves, remaining cinnamon and one very finely chopped red onion, add the marinated rice and stir it , do this on a low flame. 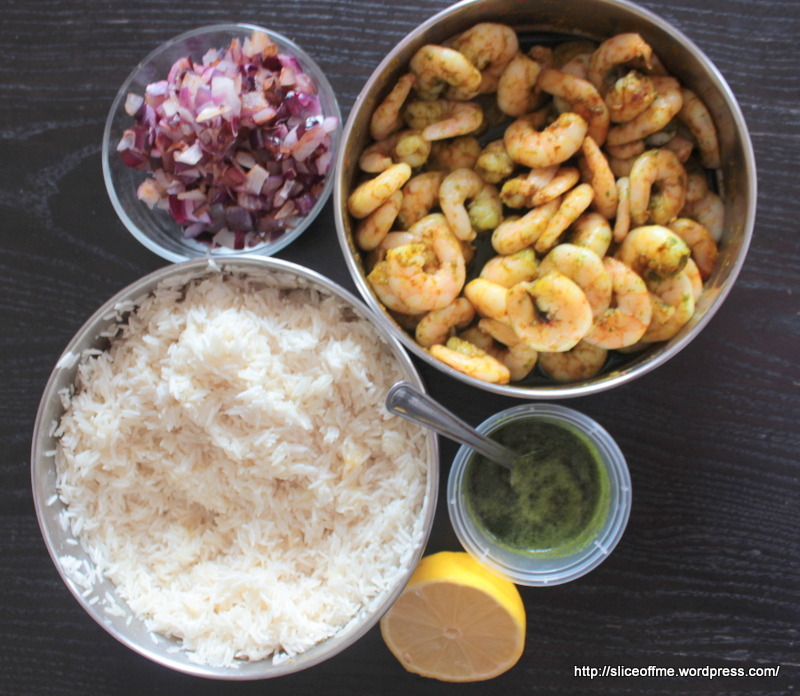 Then add the marinated prawns and water, for rice dishes water is always double the measure of the rice used so for 2.5 cup measures of rice use 5 cups of water. Cover and cook on a low flame. Serve piping hot with curd or pickle. I generally serve this with a spicy Curry. In a pan heat some oil and add asafoetida one pinch , add puree of 2-3 large red onions and one tomato and puree of 1 handful of wet grated coconut , season with red chilli powder , turmeric,salt, green masala, goda masala and cook on a low flame with enough water to ensure a thick curry , Amp up the red chilli powder and green masala to your level of tolerance of spicy food ! 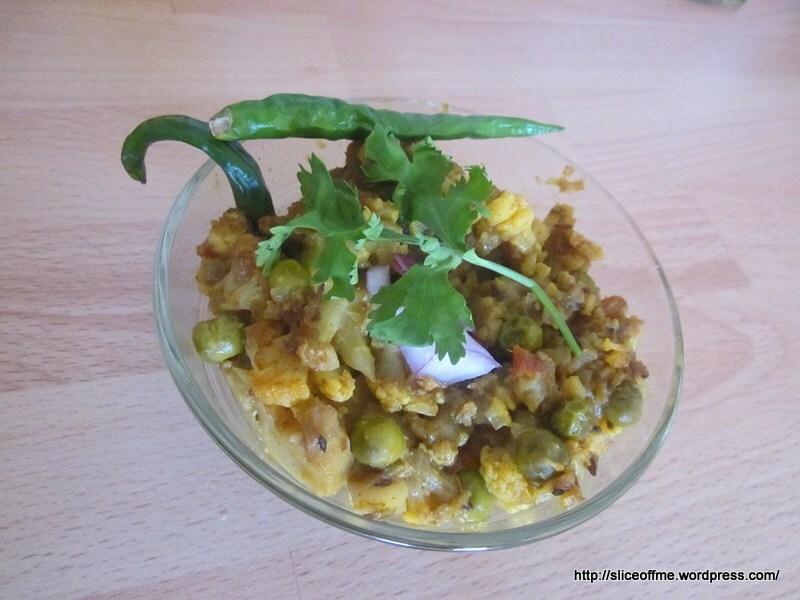 Do let me know via comments if any of you made this dish and what you though of the recipe! P.S: Forgive the poor image quality , I have a Simple Canon Camera which I am unable to use too well and add to that the total lack of any photography skills but well the food tasted awesome :), that’s what counts right , hehhe! To my absolute delight, he helped me add a new lens to my kit and gifted me a 50mm f 1.8 lens this year on my birthday. It is great for close-up food shots and true to the reviews, it works well in low light conditions. The image below is from my kit lens where am struggling to fit everything in frame and focus on the prawns, I have sharpened the image, adjusted light and cropped it using Picasa 3.